Once the Rochester Subway was opened in stages during 1927-28, five steam railroads soon were clamoring to use the new Subway to interchange freight cars. New York State Railways had been assigned to operate the subway by the City of Rochester, and found it would have to obtain an electric locomotive for the line’s freight operations to replace a rented locomotive. Having a long history of rebuilding cars rather than buying new, NYSR decided to order parts from General Electric and assemble them at its St. Paul St. shops. With a length over bumpers of just 35’-6”, L-1 was not a particularly imposing locomotive. However, its massive GE RM-63-B trucks gave the car an air of strength. Great strength certainly was provided by the four GE73 (75 hp. Ea.) motors powering L-1. When fully loaded, the car weighed in at 100,000 pounds, much more than an R&E interurban car’s 70,000 pounds having the same motor equipment. This great weight and high power explains why so many photos show L-1 hauling long cuts of railroad freight cars. A single cab, measuring 16’-6” in length and having a center height of but 6’-6”, housed the car’s control equipment and provided shelter for the crew. The type M control used GE C-137B controllers in the cab and GE DB-260-D6 contactors to make the connections needed for adding or subtracting resistance from the motor circuit. Two massive GE CP-30 compressors, rated at 35 cubic feet per minute each, supplied enough air to safely operate a train of freight cars. By comparison, the Westinghouse DH-25 compressor on NYMT’s operating cars (ex-Philadelphia and Western 161 and 168) supply 25 cfpm. To help haul single cars up the steep 6% ramps on some subway freight sidings, as well as longer trains on the Subway mainline, two ½-ton sand boxes, one on each end of L-1’s deck, supplied an air-powered sanding system. 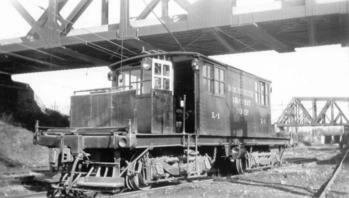 When L-1 entered service in May, 1928, it became New York State Railways’ last new electric car. The pride of the employees who built the car was clear to see when anyone read the “Built by N.Y.S.Rwys” plaque inside the cab. L-1 proved to be the workhorse of the Subway’s freight operation, even though Subway locomotives 0205 and L-2 later took some of the load. Our photo shows L-1 in 1946, about midway through its career, under the B&O bridge near the Subway car house. The Subway’s electric freight operation outlasted the demise of the line’s passenger service by more than a year. When it came time for the last sad day of electric freight operation, on August 31, 1957—some fifty years ago—it was no wonder that L-1 saw duty. It was a tradition of sorts to use the last-built car on the last day of service in Rochester, city car 1249 (built 1916) having performed such honors for the city’s surface lines in 1941 and subway car 68 having done likewise in 1956. Now, in 1957, it was L-1’s turn. After the car and crew posed for a last-day photo in the court Street Yard, L-1 trundled off into the darkness of the Subway tunnel, closing down the historic electric railway era not only in Rochester but throughout all of upstate New York. Lest L-1 be forgotten, a small relic survives to this day. The plaque placed by the proud NYSR employees who built the car in 1928 graces a wall in the NYMT main barn, just a hundred feet or so away from where electric cars once again prowl the rails.